Saw it Saturday evening. Woke up Sunday morning still thinking about it. I might go see it again. Really great documentary. A wonderful reminder of what matters most in life. Fred Rodgers poured loving kindness upon everyone he encountered--especially the most vulnerable among us--inviting us to embrace our own vulnerable, childlike parts. Everyone should see this movie... I am a late 60's kid and have memories of Mr. Rogers Neighborhood... They did such a great job in showing the real Mr. Rogers who was exactly like you saw on the show according to his close family and friends. He contributed so much to children and the whole world with his simple message of You are special just the way you are mantra. I left feeling like I had been hugged and with hope. Our country... actually the world... would be a better place if everyone (especially our political leaders) if we all watched (and learned from) Mr. Rogers! As his series of programs, which many of us encouraged our children to watch (and watched with them), this documentary is lovely, kind, sweet, significant, and worth watching! It should be available to ALL, at ALL times... in the permanent library for ALL! As a mother, grandmother, former teacher, reading consultant, multi-year school board member, PTA leader, public-school activist, and caring community member/leader, as well as the former manager of the instructional television department of a PBS affiliate, I wear an old Mr. Rogers tee shirt with pride. I urge everyone to see, and learn from, this movie! It is a gem! Wonderful; Too bad parents didn’ t listen. A must see especially for people who had childhood issues regarding self worth. I liked it all. Some was so moving that I cried. I learned so much about Mr. Rogers that I didn't know though my children watched him a lot. He was so passionate about what should be on tv and about children needing love. Stay until the very end, even the credits. Best documentary I have ever seen. Authentic and pure. I cried almost the entire time. Loved the movie. The movie gave me an insight into how and why different sketches were aired, which I never really gave much thought to. I just enjoyed the calm, peaceful, caring way he shone on television. This is a documentary worth seeing. It was well put together. It was nice to see how well everyone got along on set. There was also some funny moments. I would definitely recommend seeing this movie. A chance for the viewers to see how truly genuine Mr. Rogers was. His speech before Congress shows that you don’t have to loud to be powerful. A brilliant documentary! Mr. Rogers message if love, kindness, tolerance and inclusion was a gift to the world. This film has perfectly captured the essence and philosophy of this gentle, compassionate man. 143 Mr. Rogers! You don't need to be a documentary fan to love this film. Fred Rogers was a man of conviction who truly believed that the way to a better life was to help and love your fellow man. He had the courage to fight for his convictions and thus enriched the life of millions. This movie is inspirational. In his own words, I love as you are. The film was actually quite interesting and well documented. I used to watch Mr. Rogers with my kids so I am familiar with the topic. 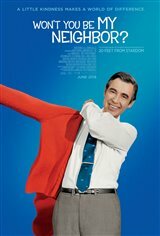 Well made documentary that was insightful into the philosophy of Fred Rogers. It shows that his message is still relevant today. Amazing movie. Very interesting how an idea can grow into a belief with such a strong foundation, giving a voice to those who need it most. it was kind of great to see the behind the scenes life. Very good movie!! Definitely got a little teary eyed during it. Highly recommend anyone to see! !